The ever-evolving trends in fashion industry demand a contribution from everyone and expect everyone to follow the bandwagon. To make the industry more accepting and appreciative of the diversity of cultures, we need to bring in fashion styles that represent all of them. With the rise of feminism, women's fashion went through a lot of changes. This has decreased the possible ways of wearing one's ethnic jewellery, except for grand wedding ceremonies and brought diamond and pearl jewellery in vogue. However, with fashion bandwagon's acceptance of the variety, we can still incorporate our traditional jewellery with any sort of clothing. It used to be unthinkable for someone to wear traditional jewellery with anything, except ethnic clothing. However now, the tables have turned and fashion has changed to be better and favourable to all sorts of styling. Lately, we get to see a lot of designers, stylists and celebrities wearing folk jewellery with western clothing like gowns, maxi dresses etc. Make a statement by combining classical jewellery with western outfits by balancing the bling between them. Heavy jewellery like Kandoli Jewellery Designs would go with a light to no bling attires and vice versa. RINGS: Wear something that enlightens you to look at while you type all the documents down. flimsy rings like a wedding band, un-cut diamond, single or multiple gemstones. Make sure that you do not overdo it. You may wear one to two rings a day at maximum, as one doesn't want to look too chirpy with many rings. BRACELETS: Let them remember those formal handshakes with your statement-making chain bracelets. Wearing bangles and clattery bracelets could hinder your hand movements and be a distraction for you and others. Also, you may want to design your bracelet with a lobster clasp, so that you do not lose it. NECKLACES: Go with your instinct. Choose anything that is light-weight to feel and in appearance too. If you are high on budget, then a delicate diamond pendant would be a wise choice. Otherwise, you may want to wear an intricately designed gold pendant with tiny studs at the rim. As married personnel, one could adorn a simple and elegant mangalsutra. EARRINGS: One the days when you feel like peachy, go with the basic stud earrings. Choose delightful, yet tiny, dangle earrings for the one with purple and pinks. You may as well go with the classic Sui dhaga chic earrings when you feel like it is Friday. Dressing for a day out? Allow some pearls in your guise. You may go with a choker to a rope, whatever matches the neckline of your shirt. You may want to go for more than one layer of pearls, but not all of them. South Sea Pearls are known to be one of the best in making those shiny bright pearl necklaces. 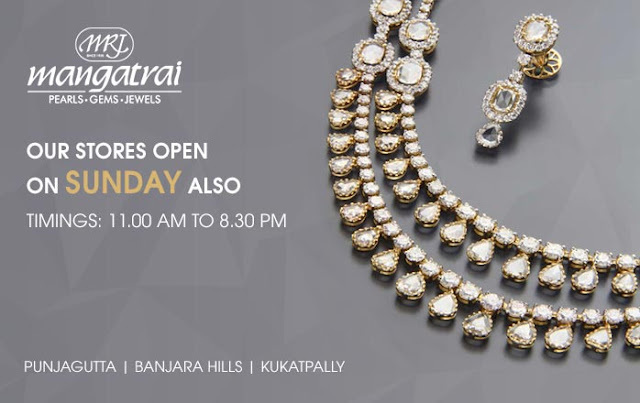 Founded throughout 1935, Mangatrai Jewellers is a family organization of 4 generations of reputed suppliers interacting throughout Pearls, Precious stone and Valuable Gems. Coming from a small, humble starting, Mangatrai Jewellers possesses progressed in to a foremost diamond supplier and exporter which has a client base that straddles the Indian subcontinent, Europe, UNITED STATES and the Beach nations. The unswerving motivation to help quality possesses bought people the name for making top quality diamond of polished worth and real luxury. In the past, a mix of noise management, smart market evaluation and powerful motivation to help advancement and top quality possesses manufactured the particular brand ‘Mangatrai’ the recognized one who resonates using clients and will be offering clients an outstanding worth idea., brand ‘Mangatrai Jewellers’ can be interchangeable using luxury, elegance and attractiveness throughout diamond. We are experts throughout pearls and gemstones taken in the most significant diamond top quality cultured pearls of Questionnaire, Tiongkok, Philippines, Myanmar, Asia, Philippines and Tahiti. Every Mangatrai gem can be meticulously scrutinized, assorted and scored by highly trained specialists, bringing about guitar strings and strands in the finest quality. We were the 1st to help bring in the newest gemstones ‘The Tahitian organic color cultured pearls’ on the market. In acceptance in the same and our maintained motivation to help quality, many of us were felicitated because of the Tahitian Federal throughout 2005.